Thousands of Detroiters and other Wayne County residents will be evicted from their homes in the next month, as the Wayne County Treasurer auctions their homes to investors following tax foreclosure. This is an entirely avoidable crisis! The State of Michigan is sitting on $200 million in federal Helping Hardest Hit Funds that can be used to pay delinquent property tax bills for occupied homes. But instead of using these funds for their stated purpose, to keep families in their homes, the State and Federal governments are using these funds to tear down homes and turning them over to the “blight taskforce” led by Dan Gilbert. A recent Detroit News report documented how it was the banks along with Fannie Mae and Freddie Mac who are responsible for the destruction of Detroit’s neighborhoods, through their massive foreclosures on predatory, sub-prime mortgage loans, and then selling off the properties to “investors” for a pittance, who in turn never paid the property taxes. Of the 84,000 properties on the city’s blight list, 76% are foreclosures. 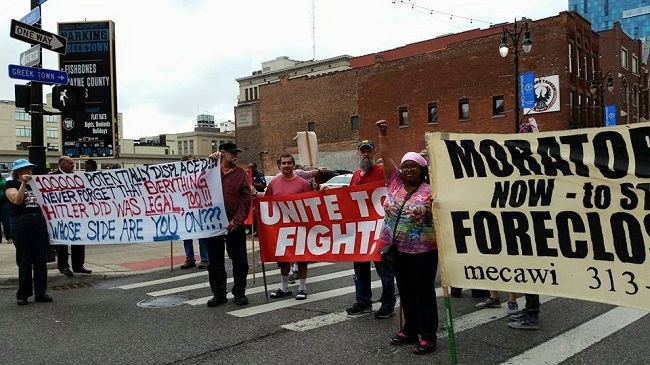 The banks, Fannie Mae and Freddie Mac, and lenders like Quicken Loan must be made to pay for the blight they caused through their massive foreclosures in Detroit and throughout Wayne County! To learn more about the role of Quicken Loans in the destruction of our neighborhoods, click here.